Cuban born guitarist, Rafael Padrón, began studying the guitar at the age of eleven. He attended the National School of Art in Havana, Cuba, where he completed his studies with the distinguished Argentinean teacher and performer, Victor Pellegrini. In 1986, he was awarded a scholarship to study at the Advanced Institute of Art in Havana, where he graduated with a degree in music in 1991, receiving the “Student of High Achievement” award. He has studied in Master Classes with such artists as composer Leo Brouwer, guitarists Maria Luisa Anido, Alvaro Pierri, Costa Cotsiolis and David Russell. 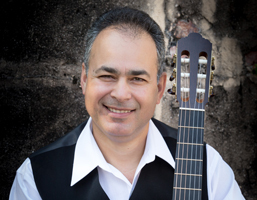 Mr. Padrón has won top prizes in many national and international competitions, among them the Best Interpretation of Latin American Music in Havana; The Diploma of Honor at the International Classical Guitar Competition in Chile; a top prize at the National Guitar Competition in Havana and winner of the Montpelier Cultural Arts Center Recital Series Competitions in United States of America. He has been featured in festivals like the International Festival of the Guitar in Havana, Cuba; The International Festival of Music of the Hatillo in Caracas, Venezuela, where he premiered Leo Brouwer’s Concerto for Guitar and Orchestra No. 3, “Elegíaco”; The International Guitar Festival in Costa Rica were he premiered Leo Brouwer’s Suite “From Yesterday to Penny Lane”; The International Festival of the Guitar in Panama, The International Music Festival in Costa Rica and The Festival Iberoamericano de Guitarra, Tenerife, Spain, Rust International Guitar Festival and Competition, Rust, Austria, and Brno International Guitar Festival, Czech Republic. Rafael Padrón has performed both solo and with orchestras in various cities in Cuba, Chile, Venezuela, Costa Rica, Japan, Spain and in the United States of America. He has performed as a soloist with the Symphony Orchestra of Matanzas, Cuba; the Grand Marshall of Ayacucho Symphony Orchestra of Venezuela; the Chamber Orchestra of Caracas, Venezuela; the Camerata Latinoamericana of Costa Rica,The Independence Symphony Orchestra in Costa Rica, Panama National Symphony Orchestra and with The Panamerican Symphony Orchestra of Washington D.C. Currently, he is the Program Director of Classical Guitar at Frost School of Music, University of Miami.